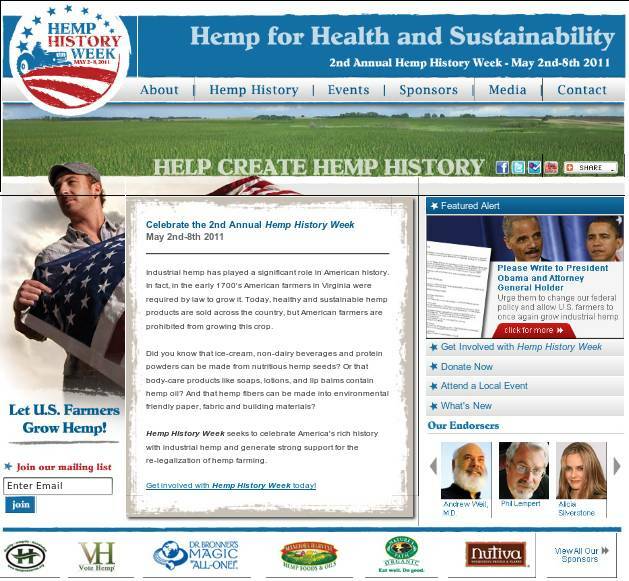 Hemp History Week is about education and it's also about political action. We hope to generate 25,000 letters and emails addressed to President Obama and Attorney General Holder. Send a Virtual Postcard to President Obama and Attorney General Holder with Vote Hemp's email system. Please remember to Sign the Petition as well! Write a letter or email to your representatives asking them to support hemp farming. Research your local hemp history by visiting your library, historical society and newspapers' online news archives to see when hemp was grown and/or processed in your state. Then share what you have learned with us and your friends. Spreading the word about the need to resume hemp farming in the U.S. will help build awareness around the issues. Writing a letter to the editor of your local newspaper(s) is also an excellent way to help educate people. Submitted by savcash on Fri, 05/06/2011 - 10:09. Submitted by Norm Roulet on Fri, 05/06/2011 - 11:07. Yes, they find Cannabis cures cancer. Is anyone in Ohio paid to cure or treat human cancers? Are they knowledgeable about treatment with cannabis? Why would anyone go to a doctor who does not know how to treat cancer? Why would anyone live in a place where the best treatments for cancer may be illegal? I wouldn't!